The man decided to pull over to take a closer look. As he exited his car, he was shocked to see several “workers” around what appeared to be some sort of strange craft. Those workers, upon being spotted by the man, scrambled into the craft, which began to make strange noises before it “disappeared completely.” The man was able to snap a single photo with his cell phone before the craft disappeared. That photo, shown below, accompanied the newspaper article (the text is also from the original article). 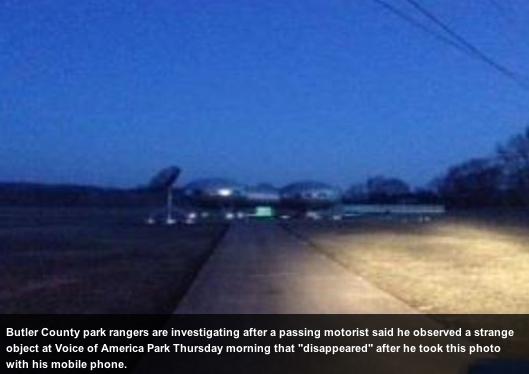 The man said he waited several days before coming forward and reporting the incident to Butler County Park rangers, who were now “investigating” the whole thing. Spoooooky! To be honest, I didn’t make it all the way through the cincinnati.com article before I began smiling. I knew it was all a joke as soon as I saw the photograph of the “strange object”, which is actually a house in Carlisle, Ohio. 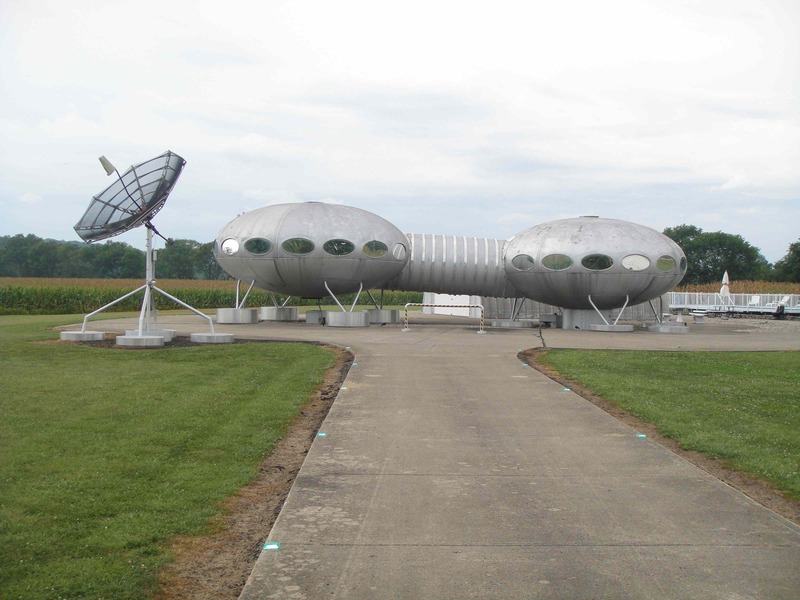 Known locally as Futuro or, my personal favorite, the Mating UFOs House. It’s actually become quite the roadside attraction over the years. But where you really can’t be forgiven for is reading this story on APRIL FIRST and not at least pausing for a second to allow your morning caffeine to kick in before taking to the InterWebs and lashing out at everyone and anyone. But that’s just what happened in Southern Ohio on this April Fool’s Day. Almost as soon as the article was posted, people were angrily posting comments about how “fake” the whole thing was. Not that it was part of an April’s Fool Day joke, mind you. Rather, that we, as full-blooded tax-paying Americans, were being duped into believing that UFOs had landed. And that’s what makes this joke so perfect; people fell for it! One commenter, who actually identified the Futuro House (even adding a “duh” at the end of her post), still apparently missed that it was a joke because her post implied that she thought park rangers really were investigating the whole thing. In fact, she was so angry that she went so far as to ask the Powers That Be to please “stop wasting taxpayers’ money by using rangers’ time on this”. Like ALL the other BS pics of UFO’s and Sasquatch. This is just out of the light or too dark, or fuzzy or…… with all the camera’s out there, still not ONE really good picture. All fakes. How else could the thriving media business of ghosts and all the rest make any money? Facebook is alive with other crap cures and phony claims. Time to put on my suit and sneak around the woods. Can’t you just feel the anger in his words? I mean, this silly April Fools joke got so stuck in this guy’s craw that he actually took the time to log onto his Facebook account in order to leave his scathing message before dashing off to put on his “suit and sneak around in the woods.” My guess is that the suit he’s referring to is either an alien costume or perhaps a Bigfoot one. Well, either that, or he just some sort of weird stalker guy who simply enjoys formal wear. To be sure, this was not a hoax. Nor was it simply an April Fools joke. It was actually a bit of guerrilla marketing designed to make people aware of the fact that there were new athletic fields available at Voice of America Park. And it worked brilliantly. If you read the original article, not only were people made aware of Voice of America Park and their new athletic fields, but they even gave the name of the street the park is located off of. And if people still thought the story was real and decided to drive out to the park, they were greeted by several blow-up aliens near the front entrance, posed around a sign about the new athletic fields. So see? Nothing to be angry about here. Just a MetroPark using April Fools Day as an opportunity to raise awareness about a new feature at one of their parks. No alien invasion. No conspiracy. No waste of taxpayers’ money…unless, of course, you want to take issue with a park ranger getting paid to blow up a couple of alien-shaped inflatables. But you know, I did see something weird on the news the other night that I think might be a hoax. This guy had a picture of a Sasquatch that looks too good to be true. It’s my expert opinion that this is a hoax and that some major corporation is behind it all. I just don’t know what their End Game is…yet. I am suddenly hungry, though. Here’s the link to the original Cincinnati.com news article, which now has the “April Fools!” blurb added to the top of it.